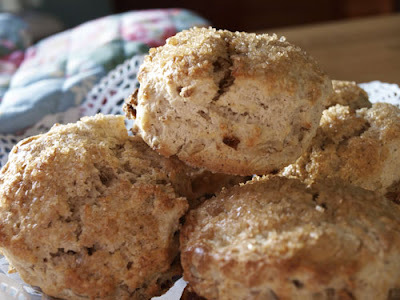 Farmersgirl Kitchen: Date and Walnut Scones - A Scone Challenge! The Bakelady's Blog has put up a Scone Challenge and as I find scones really quite easy to make, I thought it would be good to have a go. There are many different recipes and ingredients to include in a scone, but I fancied date and walnut. I scoured my cookbooks, but couldn't find a date and walnut recipe, so ended up combining a couple of Good Housekeeping recipes from the 'Complete book of Home Baking' i.e Spiced Walnut Scones and Date and Yogurt Scones. Place the flour in a bowl with the baking powder and mixed spice, stir until well mixed, rub in the butter (or whizz in a food processor). Stir in the sugar, dates, walnuts and sugar. Pour the milk into a well in the middle of the flour and mix with a palette knife to a soft dough. Oooo ooo oooo, love dates!! I have a date scone recipe-- I clearly need to make it!! Oh your rubbing it in (pun not intended) the wounds of us heavy scone makers - easy indeed ;-) I'm just envious - your scones look lovely and sound really good with dates and walnuts too.